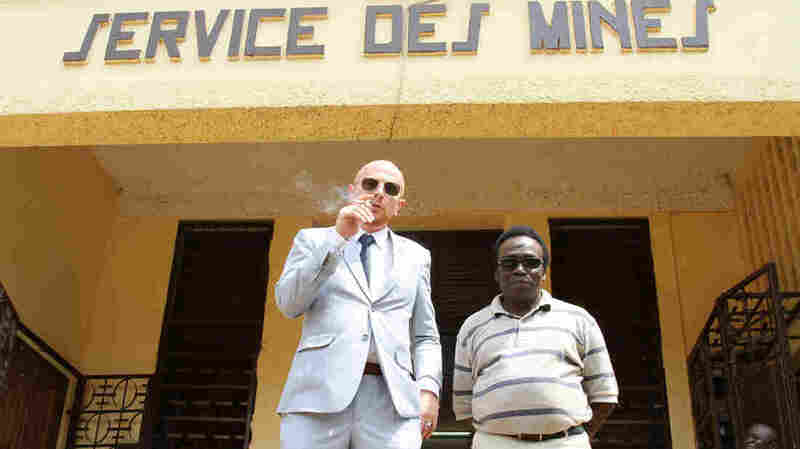 Movie Review - 'The Ambassador' - An 'Ambassador' Of Sorts, But Hardly Diplomatic Filmmaker Mads Brugger went to the Central African Republic to document rampant corruption in the capital, flourishing the credentials of a Liberian diplomat to connect with government officials and angling to buy "blood diamonds" to smuggle out of the country. "If the Congo was the heart of darkness, this is the spleen." That's how Danish guerrilla filmmaker Mads Brugger introduces the Central African Republic, the focus of his hidden-camera documentary The Ambassador. Brugger — who toured North Korea under false pretenses for his previous film, Red Chapel — actually flatters his latest destination by comparing it to the noble spleen. If the CAR is not the most publicized African nation, that's not because things are going well there. It conducts elections, but can't be termed a democracy. The country has one of the world's lowest per capita incomes, and "blood diamonds" are its leading export. Gems that can be smuggled out in diplomatic pouches are what Brugger seeks when he arrives in the CAR, posing as Liberian consul Mads Cortzen. Actually, "posing" isn't quite the word. Brugger actually has Liberian diplomatic papers, purchased from that country's officials with the help of a Dutch fixer after a British one failed to deliver. The European connections are pivotal to Brugger's endeavor. Most of the corrupt, self-serving people he captures on video are African. But the filmmaker's real subject is the shadowy persistence of European colonialism in supposedly autonomous Africa. The CAR is, he says, "a magnet [for] white men with secret agendas." Boosting the pre-independence vibe, the soundtrack features old-timey tunes by The Ink Spots and The Mills Brothers. In Bangui, the CAR's capital, "Cortzen" is told that France still essentially runs the country. One of his clandestinely recorded contacts, the country's head of internal security, is a French Foreign Legion veteran. The Italian consul is reportedly dealing in bootleg gold, and rebels have just seized a part of the country, supposedly because it's rich with oil. And now the Chinese are moving in. The director dispenses U.S. dollars and CAR francs in "envelopes of happiness," pretending to establish a match factory as a cover for his operations. He even summons a match expert from India, and visits a pygmy village to discuss hiring its residents to make matches. That will increase the product's marketability, the consul claims, because other CAR residents believe strongly in the power of pygmy magic. Brugger's alter ego dispenses such racialist baloney frequently, and doesn't usually explain the source. Is he drawing on genuine attitudes, or just riffing on general notions of ethnic and tribal stereotyping? The director is clearly lampooning his new colleagues when he commends the champagne he's serving them by claiming that Hitler drank it just before his suicide. At other times, he just seems to be in a puckish mood, or a little frustrated that he can't go entirely Sacha Baron Cohen on these roguish acquaintances. The story is complicated by the would-be consul's quest for his diplomatic papers, and by a diamond deal that looks as if it's going wrong. As a newcomer who's hiding his real reason for visiting the CAR, Brugger has limited control over the narrative. Only rarely does he leave Bangui's offices and hotel rooms to see the exploited country and its oppressed inhabitants. The Central African Republic is a violent and often lawless country, which makes The Ambassador a brave undertaking. Yet the movie lacks enough context for the general viewer, or the Mike Wallace-style showdown that would provide a big finish to all the filmmaker's skulking. The bold Brugger gets some interesting stuff, but it doesn't quite add up to an expose.